Thrift store cutting boards have become my favorite new decor obsession. They're super cheap, easy to find and even easier to completely makeover. This post contains affiliate links for your convenience. See my full disclosure for more details. Last weekend, the temperatures soared to almost fifty degrees after a solid week of single digit days. It was so nice outside that several of the thrift stores in our area decided to host sidewalk sales. My husband and I had been dreaming of warmer weather, so we were game. I didn't really need anything, but it was a perfect excuse to go shopping. I think we scored something at every place we stopped. I know, I know, I'm simplifying, but I found a bunch of bargains I just couldn't pass up. I love crafting, it's my therapy, so when I see something that calls to me and the price is right, I just can't help myself. I guess the upside is I now have a pretty good collection of things I can play with...including a really cool cutting board. It's shaped like a wine bottle, I guess it was originally meant to serve cheese along with the vino, but I just saw a rustic paddle. I could picture a few farm animals stenciled on the front of it, propped up in my own kitchen, making me smile. And for under $3.00 it wasn't going to break the bank. 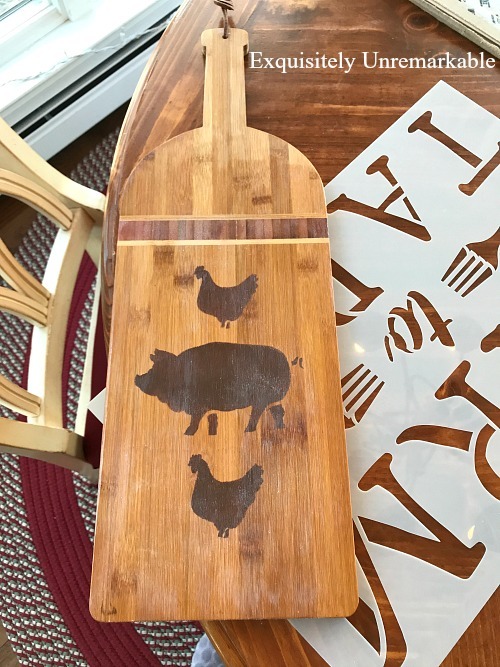 I already had this adorable cow pig chicken stencil from the folks at Stencil Revolution and I knew I could transform my thrifted wine bottle into a fabulous piece of farmhouse decor. I wasn't wrong. But I'll let you be the judge. I started by planning out exactly what I wanted on the board. One animal? Two? All three? Hmmm. I knew I wanted the chicken so I started there. 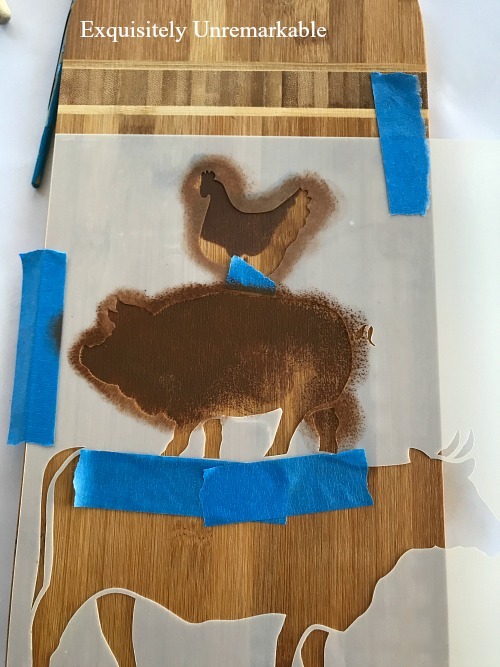 I also knew that I wanted the piece to look as if the designs had been burned onto the wood, rather than painted, so I went with a brown craft paint. To begin, I washed my cutting board and wiped it dry. I made sure all the dampness was out of the wood before I positioned my stencil. Then I taped it down to make sure it wouldn't budge and smudge when I added paint. I also covered the top of the pig, so that I wouldn't accidentally get paint where it didn't belong. I used a foam sponge pouncer and gently added paint to the stencil. The only tricky part here, was making sure that I didn't have too much paint on the sponge or it would bleed underneath the stencil. This is a case when less is definitely more. When my chicken was dry, I started on the pig. I just repeated the steps from above. I did use a ruler to help with the spacing, but to be honest, I always defer to my eye. At this point, I was at a crossroads. I couldn't decide if I wanted to add the cow or not. It was a little too large to fit on the board. I could've worked around it and positioned the stencil to shorted the body, but in the end I decided to add another chicken. Chickens are kind of my thing. Why fight it, right? Once I added the last chicken, I was smitten with my creation, but thought it needed a bit more, so I took a little red paint (big surprise!) and used it to darken the horizontal band at the top. It really made it pop. The last step was adding a sealer to make sure my design stayed put. 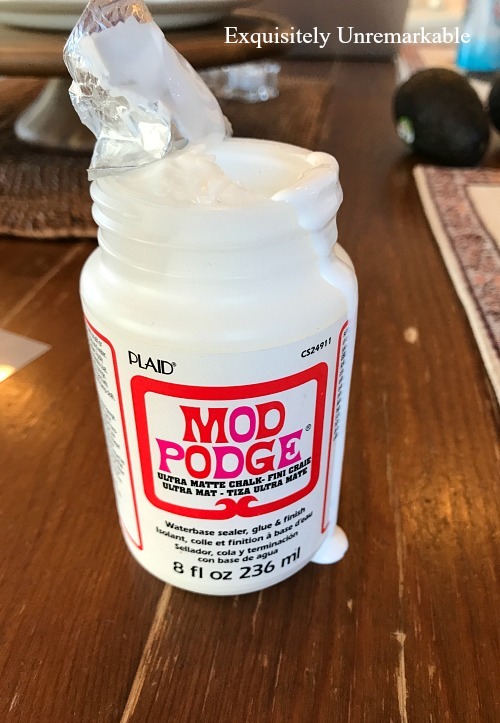 I had picked up this ultra matte chalk finish Mod Podge for .97 last summer in the clearance aisle. I used a foam brush to apply it to the board and let it dry. It went on white, but dried clear. It wasn't shiny or sparkly, which was perfect. It was totally flat and exactly what you'd expect an old, beat up wooden cutting board to look like. I think it took me all of about 20 minutes to go from old wooden wine bottle to this fabulous farmhouse artwork. I haven't quite decided where to put it yet, but whether I keep it propped up against the subway tile or the pine server or hang it on the wall, I know it will look great. In the meantime, I'll just stare at it, in my kitchen, at night, dreaming of warm days on the farm. Even if summer is months away. And I live at the beach. 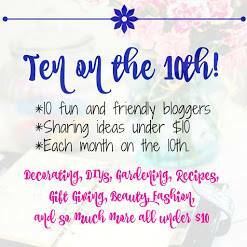 Hey, did you know that my friend Katie is hosting this month's Ten on the Tenth hop? We're featuring thrift store upcycles, like my cutting board. You're not going to want to miss all the creative inspiration, so go check them all out! This is adorable! 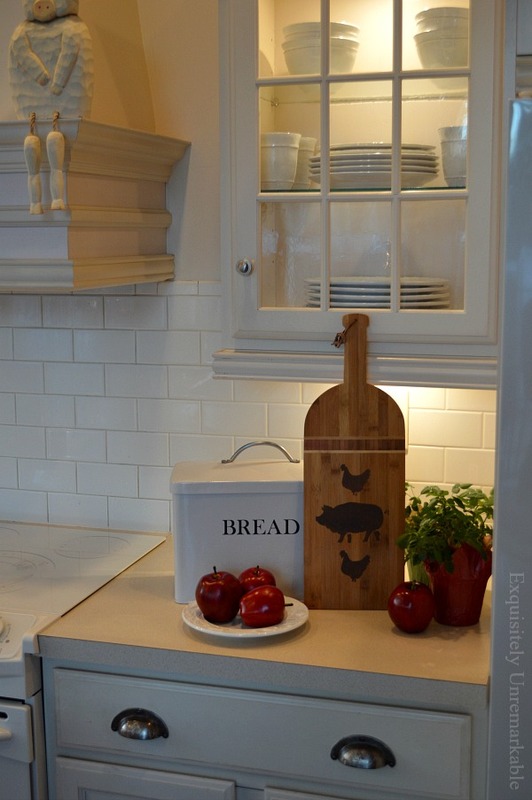 And I love your farm :) Repurposing cutting boards is so easy and they look so great! Thanks Susan! I think this is as close to a owning a farm as I'm ever going to get! Ha!! Thank you Penny! I'm actually thrilled. Stenciling makes me nervous...I'm not the neatest crafter! Wow, that is a great find! Cutting boards can be so pricey and that one is so pretty! Great find and awesome decorating job! Thanks Tammy! This one was a fun find. As soon as I saw it I knew what it could be. 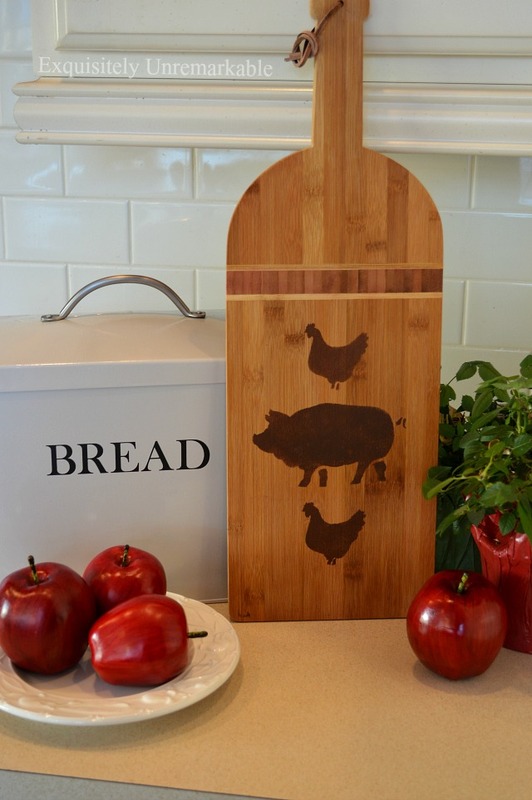 I love the cutting board and love the stencils you added! That was an awesome find. I don't think I've ever found one that inexpensive at the thrift store. I'm still afraid of stencils and need to practice, but your stenciling is perfect! Love and hugs! Thanks so may, Barbara and I love getting pinned! Happy Valentine's Day!! What a super find and this came out so cute. I am telling you girl you need to make these things and the put them up for sale. You have a great crafty way and love these things you make. I kept thinking as I was reading this, I didn't know Kim had a farmhouse too! So this must be like that cottage in the mountains of NC that is mine, only in my dreams? Well you have a start on your look in yours with this pretty cutting board! 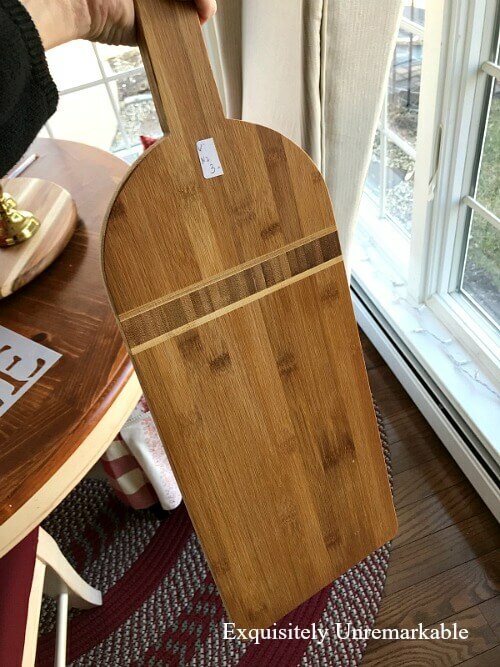 I have been looking for vintage cutting boards for two years now every time I go to a thrift shop or antique mall. I thought there would be plenty at the antique shops but haven't found a single one. I guess they were all brought up by bloggers! I wish I had a farmhouse Dewena!! There are people who have chickens and horses nearby but no real farms in the immediate vicinity. Wineries, but no farms!! 😉 And I don't think my cutting boards are vintage, most of them are probably recent donations, but they're good enough to craft with. I'm not sure I'd have the heart to paint or stencil over a true vintage piece. I'd just use that for display as is!! I really like your take on the cutting board. I was cracking up about your "the temperatures soared to almost fifty degrees" sentence. Temperature is so relative to where you live. Steve popped out to get the paper and came in saying, "it's freezing outside, 48°!" Carol, you are so right! We had a similar experience this week when we were telling a friend who lives in Southern California that we were wearing shorts because it was in the low 60’s. He said he was wearing a ski beanie because it was in the low 60’s!! So funny! Hi Kim, oh your cutting board came out so nice and it looks great in your kitchen! I love the chickens and pig stencil you used. Enjoy. Thanks Julie…this was a fun one. I totally have a thing for everything farm. Too bad I don’t actually live on or anywhere near one! Well now you've got me on the hunt for a cutting board! This is adorable and I love how you've stamped it. Enjoyed hopping with you today. Happy Sunday! Thanks Cindy! Cutting boards seem to be plentiful in my neck of the woods. Very nicely done! Your "new" board looks just perfect in your kitchen. Thanks so much! It was a fun one to make. I really need to remember to look for cutting boards when I go thrift shopping. I see the posts you've done on them & want to jump up & go look now! then I never think of them when I'm there. Jump in, Jenny!! 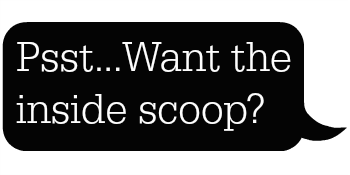 I know you'd create something fabulous!! Such a cute project. Your cutting board turned out great! What a fantastic find! The hint of red you added to the top really polishes up the look. Great job on the stenciled animals, they turned out great! I get nervous when using stencils, bleed under happens too quickly. A very cute project! Audra, stencils make me shake, but I was very careful with this one. I really wanted it to work! And thanks! I just love this! It may be my favorite redo you've shared! Oh Mari, thank you so much! ☺️I'm glad you like this one. Fabulous transformation, Kim...warmer weather is coming. The groundhog said so....he better be right! Thanks Ann…and I hope he’s right!! I need a little spring! Cold weather means more time for crafty projects inside... after you go shopping. Your board turned out cute with the farm animals. Thanks so much, Judith and I agree, cold weather is good for crafting. And Happy Valentine's Day to you, too! I keep seeing thrift store cutting board projects all over blogs - I think I need to go find me one! Very cute! I love this vignette! Such a cute and clever project. Have a love filled week! Thanks so much! What a lovely thing to say. Happy Valentine's Day! I love it. Well done, Kim! Thanks Carla! I really like this one. And Happy Valentine’s Day! Kim, we must be DIY soul sisters. 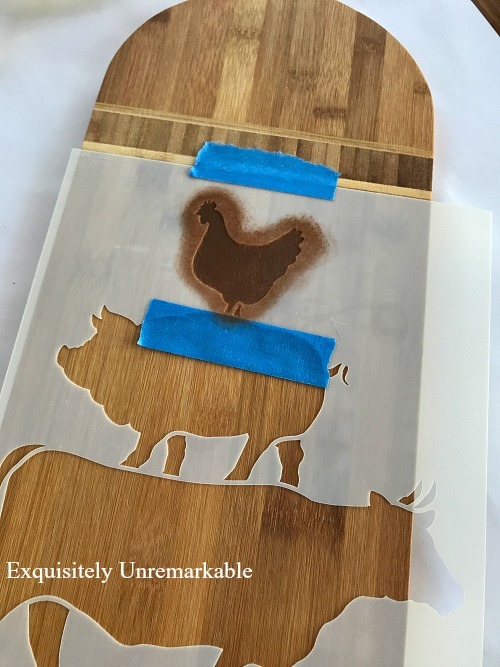 I just did post a stencil cutting board project last week! I was so excited to find 2 and had to pack them in suitcase to bring home. I love the farmhouse animal designs. Just too cute. 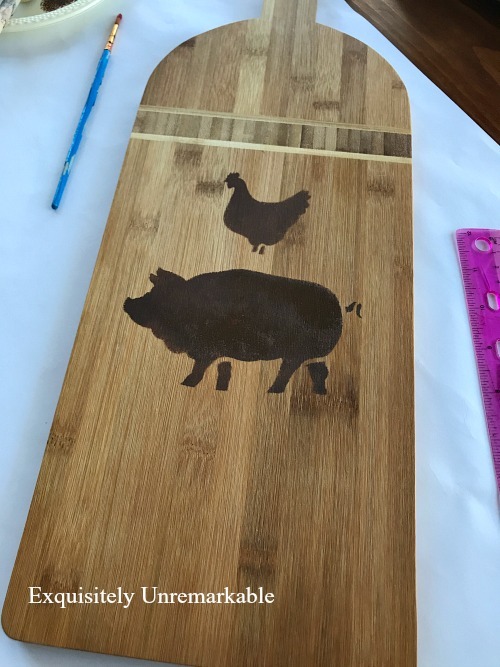 Your cutting board has such a nice shape and character to begin with and the stencils just added great flair. Adorable, Kim!! 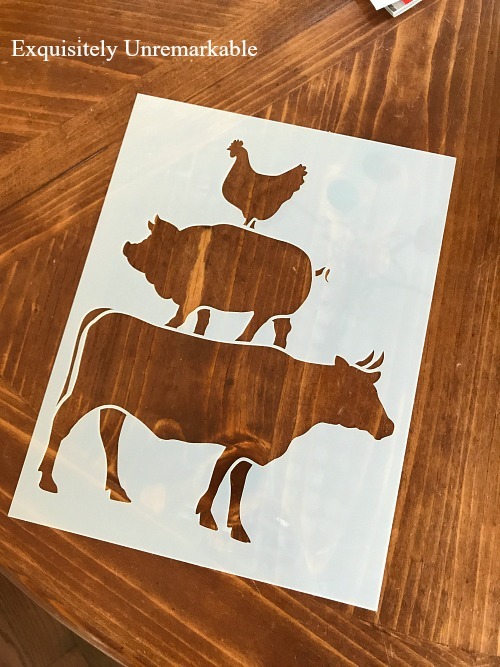 That cutting board would be right at home in my kitchen...I kind of have a thing for farm animals, there are cows, pigs, and chickens all over my kitchen! This is super cute Kim! I wish I could stencil...but I am just too messy. Great to catch up with you too! I'm pretty messy, too, Jemma. It's always a little touch and go! Happy Valentine's Day! Thanks Su! I can imagine it must be nice for a change! Great find, Kim! 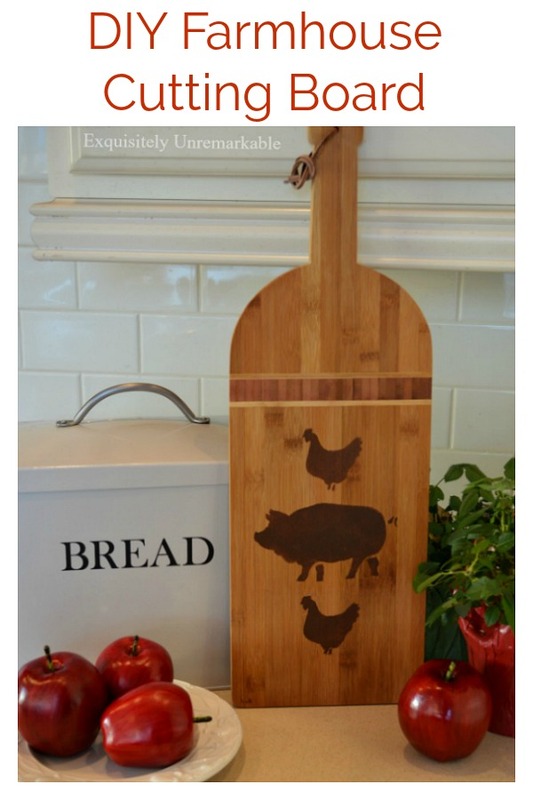 I love how long/tall the cutting board is--the stencil you used is just perfect! It was a fun find, Cecilia! It turned out just perfect Kim. Love the stencil you used although I would have done piggy, piggy, piggy ;-) I've always wanted one as a pet, but someone told me they play havoc with a garden and that scares me a little. Thanks Michelle!! I had fun with this one. I was going to do another piggy, too, but those silly chickens have my heartstrings. It looks great and it would be a good wedding gift. I would look at the cutting board at the store and think it's only a cutting board but someone with an artistic mind thinks beyond. Love it!! What a great idea, Angela! You could stencil the couple's name or wedding date or a sweet saying on it...I love sharing, because I get so many crafty ideas back!! Thanks for sharing yours!! I love your new board and the stencil is great. I was given three wooden boards by a friend. They are pale and bright and rather ugly (I suspect it was either me or the bin :-) but I've seen enough miracles on your blog and I'm not at all deterred. I'm sure I can do something with them. Thanks Jan! I do enjoy playing with the camera lately. 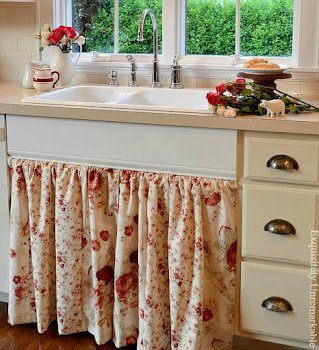 Kim that is absolutely adorable and it just oozes farmhouse charm! I need more stencils in my life!! Thanks Mary! I'm not the best stenciler, but I'm pleased with this one! Your cutting board turned our so cute, and looks really pretty in your kitchen. I love farm animals too, I collect pigs, chickens, and cows. Thanks so much, Linda! There's something about those little farm animals, they're too cute!! They are really beautiful stencils Marilyn. I have several and I can't wait to use them all. What an adorable cutting board. I love the shape and the stripe across of the original and the stencil that you chose is perfect. Great job, friend. Thanks Lorri! I think this one is supposed to be a wine bottle, but it works! I still can't stop starting at it weeks later.